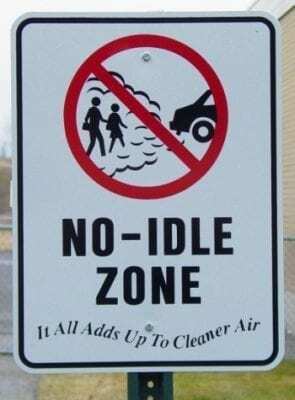 Why Support a No-Idling Policy? Economics: Saving fuel means less money spent. Human Health: Idling is usually done close to buildings, which can lead to poor air quality, especially indoors if idling is done close to building’s air intake. Environmental Benefits: Saving fuel means less emissions. Vehicle Durability: When idling, the engine is running at lower than its optimum operation temperature, which over time can cause problems. A no-idling policy is a part of good stewardship and better environmental practices goals as well as a reduction to campus greenhouse gas emissions. Click here for the CT Legislation on Idling and here for the CT DEEP Idling Outreach page.